In this step we should decide which side to place seam of inner layer as well as outer layer, so we can correctly leave overlaying part of cloth when sealing. Bellows in this example is a taper one, which side close to the camera rail (rail bed) defines seam placement. Image below shows my bellows when installed on camera, one narrow side close to the rail / camera bed. 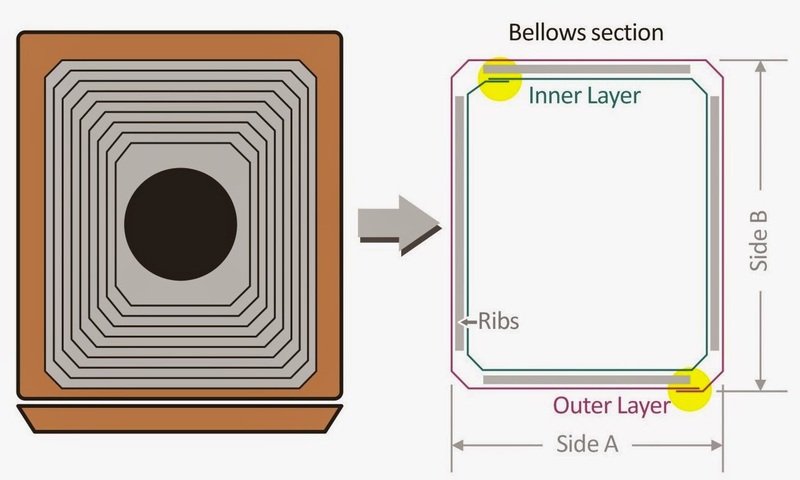 Image right side shows the section of bellows, outer layer should place seam at the bottom side, which is the narrow side (side A), so seam will not be viewed, and inner layer should place seam at the top side, diagonal to the outer seam. Observing image above, extra overlay part of cloth should be left at wider side (side B). 1. 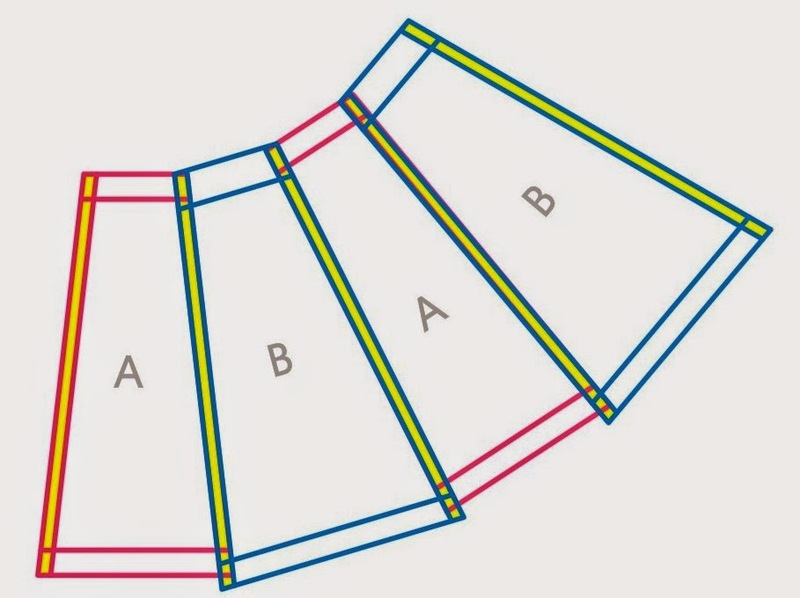 There are 4 sides of rib pairs stripes, and 4 gaps where no rib exists in between, these gaps are the places rib pairs intersect with adjacent side rib pairs. But what we have on layout template, there are 4 sides, with 5 gaps! 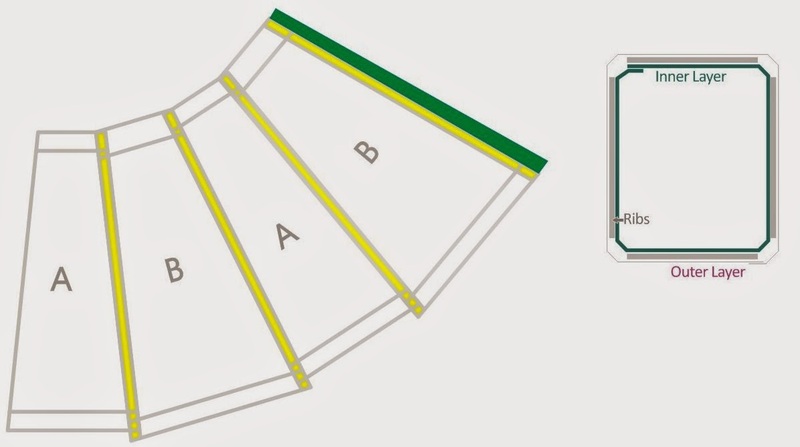 The left most gap in template is exactly the same one at the right most, they represent the gap that besides the seam. Extra one gap has to be cut off, but which one you should cut off? 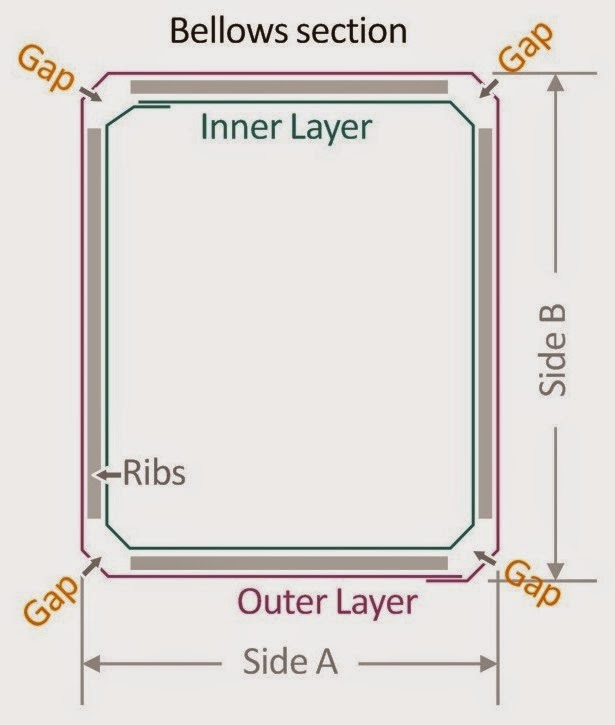 Referring to the image above, the seam besides shape A should be cut off, and not only the gap besides shape B should be kept, it also should be extended some more part for OVERLAY area. 2. With 5 mm double sided tape, paste a long stripe of tape by the side B, noticed that tape is pasted outside of the gap area. 2. Trim off bellows layout from darkroom cloth, but leave space around the layout. 3. With a very sharp blade (best brand new utility knife tip), trim the edge of shape A, leave NO gap space, and the edge of shape B, by the side of double sided tape. A sharp blade can reduce the chance resulting fraying edge, and thanks to the nylon material as well acrylic paint, darkroom cloth tends to have very brisk edge. I would trim off a little bit of double sided tape, to keep the edge sharp. 4. Before overlaying the edge to seal the seam, we should know exactly how to align both side ribs. Ideally if ribs extends to the corner, they should form a zigzag line between both side ribs, which is easy to align. Our bellows has simplify the ribs, so you have to in vision an imaging rib, which extends its base to the other side, as orange dash line shows. Always align the rib with the one that sits on the bottom line, I have told you reason why. 5. With a sheet of template plastic, roll it into a cone, fit its size exactly as bellows, now the bellows is in 3 dimension status, no need to build a bellows model for it as many instructions revealed. 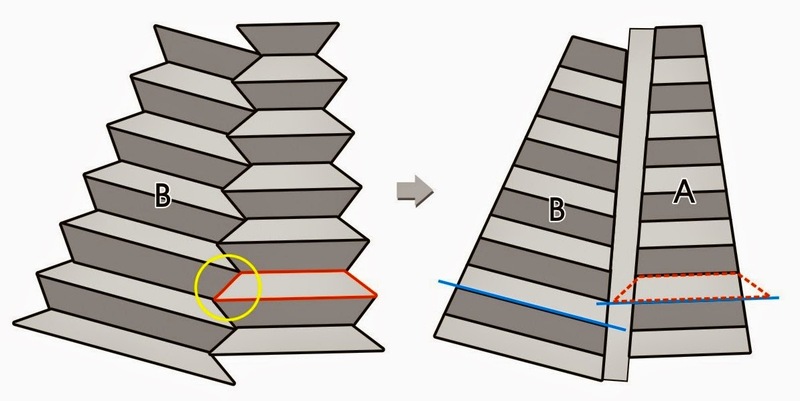 Actually, I found out that building a model for bellows tends to misguide builders, for they would set two gaps for each side and resulting a wrong size product. You can trim template plastic sheet beforehand of forming the cone, use bellows layout as guide, expand the outline as big as sheet allows, this will help if you want this cone stand still on the desk.